Remember my Loft House Style Sugae Cookie recipe from last Christmas? Well they're back and better than ever! This time around I changed up the recipe a bit to make it egg free! One less allergen means that many more people can enjoy these absolutely delicious cookies that taste exactly like the original version. Feel free to use these as this years Christmas Cut Out recipe and hand them out to all of your family and friends. No one will ever guess they are free of gluten, grains, eggs and many other common allergens! 2. In a large stand mixer bowl, combine the coconut flour, tapioca starch, sugar, baking powder and salt on low speed. Cut in the shortening starting on low speed and increasing to medium speed for about 2 minutes. 3. Add the vanilla and applesauce and mix on medium high speed for an additional 1-2 minutes. 4. Roll out dough onto a starch dusted sheet of parchment paper to 1/4 inch thick. Cut out dough with cookie cutter shape of choice and place on parchment lined cookie sheet. Bake for 14 minutes or until golden brown. Allow the cookies to cool COMPLETELY before removing from the cookie sheet or they will crumble into a million pieces! 5. Combine all of the ingredients in a medium sized bowl on medium high speed for 2 minutes. 6. 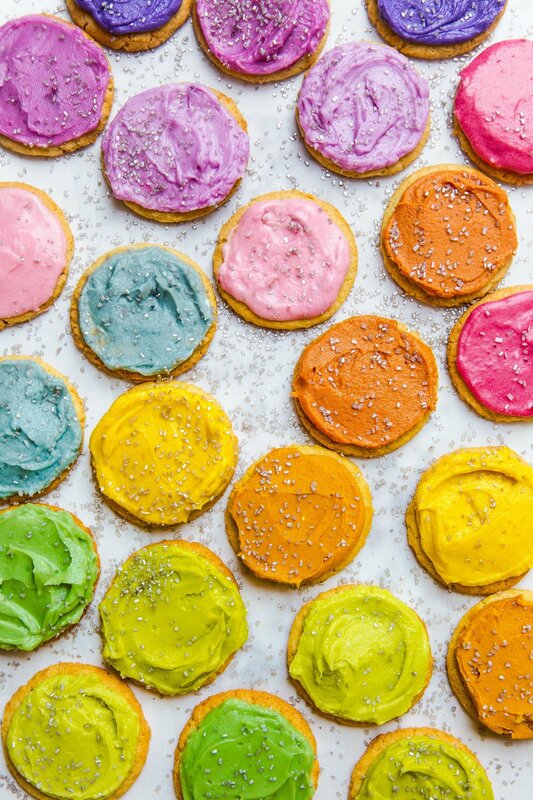 Frost the cookies using an angled spatula and top with the optional sprinkles.